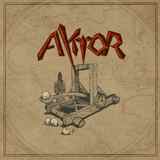 Aktor is a new band and I am not so sure I would have reached out for it if the name of Professor Black wasn't associated with Aktor. I mean this is Professor Black we are talking about, of Pharaoh, Superchrist and, especially, Dawnbringer fame. Anything this guy touched resonated with me so I had to check Aktor out as well. On I Am the Psychic Wars Professor Black collaborates with Jussi Lehtisalo of Finnish Circle and million other bands, as well as one of the main stakeholders in Ektro Records so no wonder the EP saw its release this way. The liner notes say that Aktor are not sure why they exist and where they are going with their music yet, and, in a way, it shows. When the title track starts playing you will be asking yourself what this is, and what era it is from. Not quite disco, but definitely synth pop tinged music. Drums are so steady in their rhythm drum machine is suspected, guitars warble is pushed into the background, synthesizers laze their way over and through, and quite a bit of focus falls on the Professor Black’s vocals. I could see this playing in my high school dance night with lights off and crystal ball rotating up at the ceiling reflecting lights shone through colored filters. Purpose? How is this related to metal? No idea, but retro this stuff definitely is and reminds me of my youth, when we would fight pop music played on those nights tooth and nail, Modern Talking and 60 bpm driven pop to be replaced by anything, psychedelic rock one of the styles allowed as a replacement. And when I Am the Psychic Wars shifts to some sort of rock'n'roll, without abandoning all that synth character, things get indeed borderline rocking. Buried by the Sea brings even more weirdness after some cool atmospheric rock beginnings. Then the rhythms shift away and you would feel to be a witness of a space alien invasion, as psychedelic as those aliens might be. A lot more instrumental in nature than the title track, Buried by the Sea will blip and bling along, atmospheric rock popping through the weird stuff here and there. Since the actors themselves are not sure if Aktor (pun intended) has continuation, I will have to be pretty certain in saying somewhere in their systems they had the synth pop buried (somewhere very deep) and Aktor helped to get it out. Continuation, in and of itself, may not be that necessary now.